Using NASA’s Nuclear Spectroscopic Telescope Array, astronomers have discovered a pulsar spinning five times per second and the ultimate power source of both the high-energy X-rays and gamma rays. This is not the first time pulsars have been discovered to be the culprits behind intense gamma rays, but NuSTAR has helped in a case that was tougher to crack due to the distance of the object in question. NuSTAR joins NASA’s Chandra X-ray Observatory and Fermi Gamma-ray Space Telescope, and the High Energy Stereoscopic System (H.E.S.S.) in Namibia, each with its own unique strengths, to better understand the evolution of these not-so-peaceful dead stars. “The energy from this corpse of a star is enough to power the gamma-ray luminosity we are seeing,” said Eric Gotthelf of Columbia University, New York. 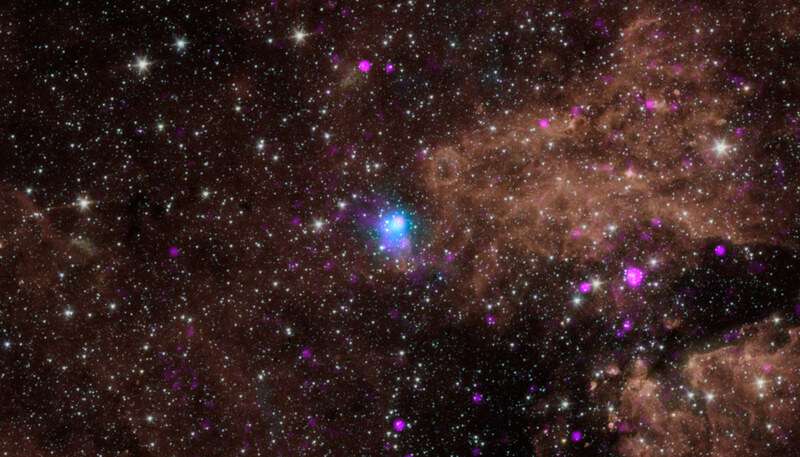 Gotthelf explained that while pulsars are often behind these gamma rays in our galaxy, other sources can be as well, including the outer shells of the supernova remnants, X-ray binary stars and star-formation regions. Gotthelf is lead author of a new paper describing the findings in the Astrophysical Journal. In recent years, the Max-Planck Institute for Astronomy’s H.E.S.S. experiment has identified more than 80 incredibly powerful sites of gamma rays, called high-energy gamma-ray sources, in our Milky Way. Most of these have been associated with prior supernova explosions, but for many, the primary source of observed gamma rays remains unknown. The gamma-ray source pinpointed in this new study, called HESS J1640-465, is one of the most luminous discovered so far. It was already known to be linked with a supernova remnant, but the source of its power was unclear. While data from Chandra and the European Space Agency’s XMM-Newton telescopes hinted that the power source was a pulsar, intervening clouds of gas blocked the view, making it difficult to see. NuSTAR complements Chandra and XMM-Newton in its capability to detect higher-energy range of X-rays that can, in fact, penetrate through this intervening gas. In addition, the NuSTAR telescope can measure rapid X-ray pulsations with fine precision. In this particular case, NuSTAR was able to capture high-energy X-rays coming at regular fast-paced pulses from HESS J1640-465. These data led to the discovery of PSR J1640-4631, a pulsar spinning five times per second — and the ultimate power source of both the high-energy X-rays and gamma rays. How does the pulsar produce the high-energy rays? The pulsar’s strong magnetic fields generate powerful electric fields that accelerate charged particles near the surface to incredible speeds approaching that of light. The fast-moving particles then interact with the magnetic fields to produce the powerful beams of high-energy gamma rays and X-rays. “The discovery of a pulsar engine powering HESS J1640-465 allows astronomers to test models for the underlying physics that result in the extraordinary energies generated by these rare gamma-rays sources,” said Gotthelf. The new data also allowed astronomers to measure the rate at which the pulsar slows, or spins down (about 30 microseconds per year), as well as how this spin-down rate varies over time. The answers will help researchers understand how these spinning magnets — the cores of dead stars — can be the source of such extreme radiation in our galaxy. Be the first to comment on "NuSTAR Discovers Pulsar Powering Intense Gamma Rays"